I surrender! I thought I had already seen one Swan Lake too much, but PLEASE I WANT TO SEE THIS ONE! I was hopeful on the Alina+Vasiliev partnership, but they exceeded by far my expectations. “Poetry in Motion”, indeed! “Like vodka and caviar”! The first review I read must have been written shortly after the performance – it appeared only a few hours after. It made me so happy I suffered from a recurring beaming smile all day long – a day with lot of appointements, I had to wait impatiently until the evening to learn more about audience and review reactions – and then I was even happier. Yes, I am a fan of both of them, specially Vasiliev, but what was more important was they had proved, even to myself, to what degree what this blog defends is justified and right. I knew that Alina Cojocaru is wonderful, excelling both in technical as in acting skills -I’m her fan. “Her Act IV, though, is terribly affecting, all frail hopelessness in the knowledge of her inescapable approaching death.” The swan role may fit her like a glove, but she went well beyond dancing it beautifully. Vasiliev’s case is different. Audience and reviewers had identified him with his bravura roles to such level, that they did not know, anymore, where the role (even choreography) ended and Vasiliev began… they could not stop seeing this “chimera” everywhere, and it was getting worse during last year. 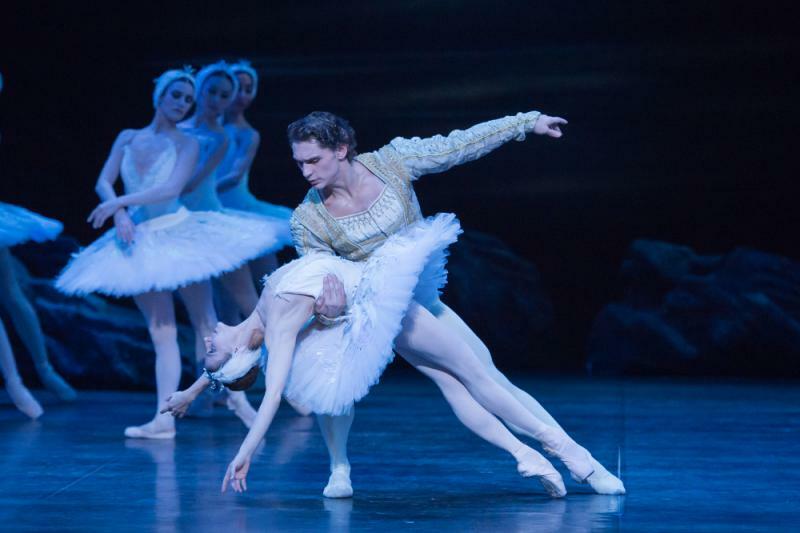 Some are still mixing things up, but as a whole, the stunned reaction to Swan Lake is a relief: it seems he was able to lift at least some of the confusion resting upon their minds. Swimming against the current (a pretty strong one), I always saw his stage behaviour as just acting, not a new personality – probably because I always valued Vasiliev’s expressive power as much or even more than our usual tricks – because of the way I see Dance. His performances in widely different kinds of roles are always in my mind, I try not to be fooled by the stage-filling showman of bravura roles. Since the beginning I placed heavy bets on his acting talent – again and again he has proved me right, stepping well outside any stereotyped image and making a great job of bringing content to dance. Every time this happens, I forget my place as the grateful fan of a great dancer, and become SO proud of him, this unwittingly champion of this blog’s position! With his Siegfried, he once more showed that long-standing rules of Ballet (like emploi) should be viewed suspiciously, and that a lot of assumptions and prejudices that had been piling up about and against him were just *********, I mean, silly. “…one its finest current interpreters…”, ” …I hope ENB might think of persuading him to return in Giselle as he would excel in this too…”, said one reviewer. His triumph. And winning one more challenge, he also gives Dance one more push forward. Great!!! Important reviewers must be intellectual, knowledgeable and sophisticated in their opinions, or they would not be reviewers. I suppose they struggle hard against being carried away, so they can give us an objective, expert-wise opinion. It’s their loss (see Sir Ashton’s quote in this blog). I’m relieved I’m not under that obligation, and free to enjoy without second thoughts. Most reviewers, specially the important ones, dwelled, once more, in… “their usual tricks”, as I will call them from now on: lenghty paragraphs on Vasiliev’s body shape and technical flaws. (Sigh). His height and thigs, AGAIN? do they not tire? It has become a boring issue by now – all audience knows how he looks by now, since all have eyes, too! And are able, and entitled to form their own opinions on the visual aesthetic of dancing, ’emploi’ or not. And technical flaws: boring TOO! all non-experts are unable to see them – provided they are there, of course – so what should they do: start looking for them and spoil the pleasure on the play as a whole?…. Dance reviewers should consider – seriously! – stop writing from a Dance millieu’s perspective, and start writing to a larger audience. This kind of remark neither informs me of something more I should know, nor is helpful to a growing understanding of Dance. What the audience would like to know is: what was so special about this performance, that made me like it so much – or what was wrong with this performance, that I couldn’t like it? THIS is educational… If a dancer makes such technical blunders that it spoiles the whole thing, this is the moment to point them out, and explain them – the audience will understand, and then avoid similar experiences. If they loved a performance, and a reviewer sees flaws only an expert can see, what should they do? Repent of their liking and start disliking?